Sugar has a very interesting story. There is a huge difference between raw natural sugarcane and refined sugar. There are 37 different varieties of sugarcane, and unfortunately the refinement process destroys the enzymes, polyphenols, antioxidants, vitamins and minerals. The refining process literally creates a substance our bodies do not chemically recognize. To clean the juice it is treated with a compound called calcium hydroxide, commonly known as slaked lime. When it is added to the juice it forms a fluffy solid that binds to the particles in the juice creating a clear liquid. The juice is then heated by steam to evaporate off most of the water. The sugarcane juice becomes a dark, thick syrup still containing most of the nutrients. To remove the rest of the water the syrup is placed in a large pan and boiled, which destroys all of the enzymes and many of the other nutrients. Then tiny sucrose crystals are added to the syrup to initiate crystallization. The crystals are removed and spun dry in a centrifuge to remove the dark remaining syrup, “dirt”, which happens to be most of the remaining nutrients. The dark byproduct left behind is actually molasses. The crystals are then given a final dry with hot air, which results in a soft, brown crude raw sugar which is 99.8% pure sucrose. The next phase is called refinement and the crude raw sugar is “cleaned up,” “purified,” and made ready for us, the end users. It is mixed with heavy syrup and warmed enough to melt the beige coating, but not too warm to destroy the inner crystal, removing all remains of nutritional value. The crystals are separated by centrifuge. Now you might think it is finished, but there is still slight discoloration caused by “impurities”. They heat for more dissolving, add more slaked lime, add phosphoric acid, which reacts to form calcium phosphate. Calcium phosphate absorbs most of the remaining “impurities” and floats to the top where it can be skimmed off. But it still isn’t the pure white we are used to. In order to get the pure, white snowy crystals we are all accustomed to the sugar is filtered through charcoal. The syrup is boiled again, crystallized again, and centrifuged to produce refined white sugar. The problem is that refined sugar is a substance not recognized by our bodies. The refining process has turned sugarcane into a chemical compound, not a food. Refined sugar is literally a poisonous toxin. Raw sugarcane is 15% sucrose, balanced by fiber and nutrients. Refined sugar, however, is an alarming 99.8% sucrose! Sucrose (white table sugar) is made up of one glucose molecule and one fructose molecule. When it reaches your stomach it is immediately broken down into its individual compounds. 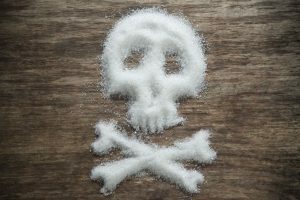 With white sugar the breakdown happens immediately and a flood of glucose and fructose are released into the bloodstream. The glucose is directed to the cells. The fructose goes directly to the liver and is converted to fat. Because there is so much sugar in our present day diet the liver also creates its own fatty pockets, resulting in fatty liver disease. In fact there is a new medical term called “TOFI”, thin on the outside and fat on the inside. What does sugar fat look like? Sugar fat accumulates in the stomach, in the back and in the top of the thighs. Refined table sugar needs to be completely eliminated from our diets. Table sugar is a foreign toxin, it is NOT a food. Unfortunately it is in eighty percent of packaged foods.